NEWS FLASH: The print version of the Meyer-Brannon paper on statistical variation of fracture patterns in a continuum code (CTH) is now available at http://dx.doi.org/10.1016/j.ijimpeng.2010.09.007. Perforation with Aleatory Uncertainty of high-pressure strength in an Eulerian Simulation. Throughout its existence, the CSM group at the University of Utah has developed computational solid mechanics models that include realistic aleatory uncertainty (i.e., point-to-point variability in material properties). Spatial variability of material properties provides perturbations in fields that stimulate intrinsic material instabilities such as localized shearing and fracture. Numerical sources of perturbations (e.g., numerical round-off and slight irregularities in the mesh) can also induce localized material failure, but the resulting localization fields are inevitably unrealistic. The classic example of spurious (non physical) localization is radial cracking in axisymmetric impact of a homogeneous material. Without aleatory uncertainty, such simulations predict radial cracking that non-physically echos the symmetry or texture of the mesh. Realistic aleatory uncertainty in material properties imposes perturbations that are literally several orders of magnitude larger than numerical round-off (or mesh-induced perturbations). The simulations that include realistic aleatory uncertainty therefore provide mesh-insensitive predictions of the ONSET of localization. From there, ensuring mesh-insensitive predictions of the subsequent dynamic PROGRESS of localization requires so-called regularization of the solution scheme, most commonly achieved via nonlocal schemes. Publications about nonlocal theories often manually introduce a perturbation source. Realistic aleatory uncertainty in material properties provides a means of introducing perturbations that can be justified through strength and scale repeatability testing in the laboratory. In 2012 (or electronically in 2010), a publication by Meyer and Brannon in the Int. J. Impact Engineering (http://dx.doi.org/10.1016/j.ijimpeng.2010.09.007) explored the effect of aleatory uncertainty and scale effects on the high-pressure strength of the target. In addition to lacking experimental guidance (at the time) for parameterizing the variability, the simulation in that paper was performed using an Eulerian code, for which material advection (even translation of only one cell) can destroy the high-frequency component of variability. Dr. Dave Benson of UCSD developed a nice correction to this problem. 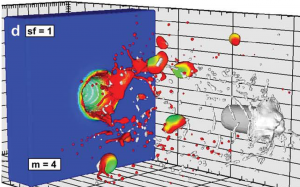 While the simulations for the Meyer-Brannon (2012) paper were being run, Brannon and Strack (of Sandia labs) concurrently investigated experimental evidence for pressure-sensitivity of variability in strength of ceramics. Though far from conclusive, the evidence suggested that variability in strength is significant at low pressures and negligible at high pressures (in contradiction to the variability used in the Meyer-Brannon research, for which no experimental data were available at the time to directly validate their choice). Additionally, the strength distribution of ceramics does not appear to be Weibull distributed except in the theoretical limit of purely spherical tension. For these reasons, Brannon’s subsequent work imposed Weibull variability in the spherical tension strength, without any variability in the high-pressure strength limit. The result is that the strength distribution for uniaxial tension (or other modes of indirect tension testing) is NOT Weibull distributed. In other words, a Weibull distribution is used in our model in order to achieve a non-Weibull distribution. This statement should be no more disturbing than the fact that random number generators always use a uniform distribution in order to generate non-uniform distributions. The Meyer-Brannon (2012) paper demonstrates that aleatory uncertainty can be implemented in an Eulerian simulation, though Eulerian advection errors can corrupt the results. The Meyer-Brannon (2012) paper employed Weibull variability of the high-pressure strength, but concurrent investigations by Brannon and Strack found that high-pressure stength is relatively deterministic, whereas low-pressure strength is highly variable. The Brannon-Strack approach to aleatory uncertainty imposes a Weibull distribution on the spherical tension strength in order to achieve high variability at low pressures, smoothly transitioning to low variability at high-pressures. The Weibull distribution in spherical strength results in realistic non-Weibull scale effects and non-Weibull strength in uniaxial tension. This entry was posted in Publications, Research and tagged algorithms, analysis, computational, constitutive, continuum mechanics, equations of state, numerical methods, simulation, Weibull. Bookmark the permalink.